In honor of #ThrowBackThursday, I am going old school and highlighting a painting that had a profound impact on me when I was young. My oldest sister went to Williams College, and my whole family went up to visit during family weekend her freshmen year. I was 13. We spent an afternoon at the impressive Clark Art Institute and I remember, overall, feeling pretty bored as we went through the various galleries. As I turned the corner and came across JMW Turner’s “Rockets and Blue Lights (Close at Hand) to Warn Steamboats of Shoal Water,” I felt as though the wind had been knocked out of me. This is a feeling I now know and understand well, but at the time I wasn’t sure why I was having this reaction. The rest of my family kept walking, but I was mesmerized by this painting. It felt as though a magnetic force was drawing me in closer. I sat for what felt like hours with this warm glow coursing through my body studying the marks on the surface. I was transfixed by how he painted the light. I wanted to scream to tell everyone what I had discovered, yet I also wanted to keep it for myself. As some magical secret that only I knew about. Three and a half years later we returned to Williamstown for my sister’s graduation. I was excited to go back to the Clark and see the painting again. I remembered exactly how to find it, but grew nervous as I got near. It was like looking up an old friend who you haven’t talked to in years. Will it be the same or will it be awkward and stale? To my delight, I was still moved by it. I noticed new attributes, saw brush marks that I hadn’t remembered before, and was more aware of the cracks in the surface. That’s the amazing thing about coming back to a painting time and again: as your understanding of yourself and the world has changed, your comprehension of the painting changes as well. 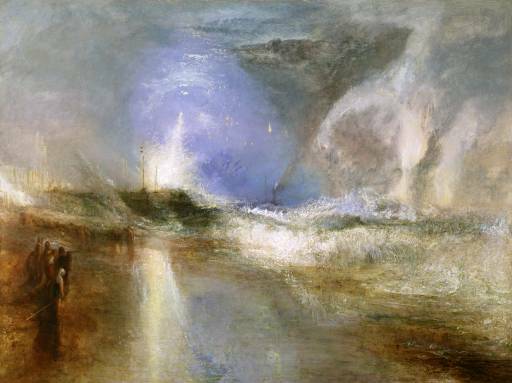 I am aware, now, that I am not the only person who has been effected in this way by that painting, as it is hailed as one of the best in the Clark collection, and one of Turner’s masterpieces. I need to make a return trip and see what I would notice now, over ten years later. I hope it would be just like old times, and that we’d hug and smile and think about all that has passed since we saw each other last.